October is Polish American Heritage Month and after the typical long, hot Texas summer, it’s time to get out and enjoy the beautiful fall weather we traditionally have in October. There are plenty of festivals and other activities going on this month and here’s a list of some of the things you can do to celebrate your Polish heritage. 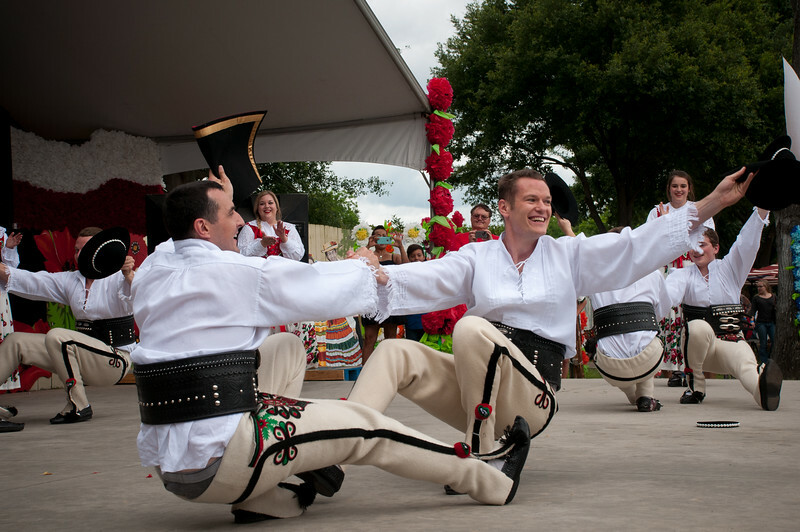 Get a jump on Polish Heritage month a day early by attending the annual Houston Slavic Heritage Festival. Under the direction and guidance of the Slavic Alliance of Houston, the Slavic communities gather annually to honor Sts. Cyril & Methodius, and to share in the celebration of their Slavic heritage with ethnic foods, singing and dancing. The general public is invited to join in this celebration and to learn about the wonderful histories and culture of the Slavic people. See the Slavic Festival Polish Texans article Or Visit The Houston Slavic Heritage Festival Website. Our Lady Of Czestochowa Catholic Church in Houston Texas wiil hold their annual Dozynki Polish Harvest Festival on Friday, Saturday and Sunday, October 11 – 14 this year. The festival starts on Friday evening from 4 pm to 10 pm and continues on Saturday and Sunday with two full days of live Polish music, dancing, folk programs, a dożynki parade with traditional harvest celebration and thanksgiving, national costumes, dożynki wreath, sharing of bread and other entertainment. There will also be activities for the kids, a silent auction and arts, craft and gift booths. Pierogi, bigos, gołąbki and other traditional Polish food will be served along with Texas barbecue and an assortment of delicious deserts. Soft drinks, beer and wine will also be available. There will be lots of good live musical entertainment and dancing by Dance Group Wawel and the Polish School Children. See the Polish Texans article about the 2013 Polish Heritage Festival Or Visit The Dozynki Polish Harvest Festival. On the 2nd Sunday in October of every year, hundreds of Polish Texans come to Anderson, Texas to celebrate the annual homecoming bazaar at St. Stanislaus Catholic Church. Make plans to join the fun on October 14th of this year. This year’s event will begin with a 9 a.m. Mass, followed by a barbecue and sausage dinner with all the trimmings which will be served at 11 a.m. There will be booths and games for all ages, a raffle drawing with lots of nice prizes and a live auction. The beautiful, historic St. Stanislaus church will be open for visitors to view. Live music by Polish dance band fiddler Brian Marshall and his group of talented musician family and friends for dancing and entertainment from 2pm until dark. This will be the 30th consecutive year that Brian Marshall and the Texas Paradise Band will provide live entertainment for St. Stanislaus bazaar. As always, it will be well worth the trip to Anderson just for the music. Panna Maria (meaning Virgin Mary) is the oldest Polish settlement in the United States. Panna Maria was founded by Father Leopold Moczygemba and about 100 Silesian families from Pluznica, and surrounding villages of Silesia, Poland. The parishioners of Immaculate Conception Catholic Church hold their Annual Homecoming Turkey Dinner every year on the 2nd Sunday in October which is October 14th this year. Along with the traditional turkey and dressing with all the trimmings dinner, there will also be a live auction, raffle with lots of nice prizes and tours of the beautiful church and museum. Genealogists will be on hand to help anyone trying to learn more about their family history. Bremond Texas is one of the oldest and most well known Polish settlements in Texas. St. Mary Catholic Church holds their annual Homecoming and Bazaar on the 3rd Sunday of October each year. On October 21st of this year, descendants of the early Polish settlers of Robertson and Falls county will come to Bremond for fun, food and fellowship. A delicious barbecue beef and sausage dinner will be served beginning at 11:30 am along with all of the fixings, home made deserts and ice tea. There will be lots of fun and activity for all ages including the Country Store, Toy and Plant Booth along with face painting and hay rides for the kids. The Homemade Goods booth will have lots of delicious Bremond food. There is also a live auction and raffle drawing. There will be live Polish music throughout the afternoon featuring Brian Marshall and Friends. Sharon & Andrzej Szpak serve up delicious Polish food at their restaurant in the Spring Branch area of Houston located at 1780 Blalock, near Beltway 8 and I10 West. This is the only restaurant in the Houston area that serves authentic Polish Cuisine. Enjoy traditional Polish favorites including bigos, kielbasa, pierogi, schabowy, golonka, paczki and more in an old world atmosphere. For a cozy dinner for two or a party for 100 or more people or anything in between, this is the place to go for good Polish food. The Texas Renaissance Festival in Plantersville , which opens on September 29th this year, is one of the most popular fall destinations for fun loving Texans. The festival will run every weekend until November 25th. Because eating good food is an important part of any festival, the Ren Fest has hundreds of food vendors to satisfy the taste buds of just about anyone. Every type of food imaginable resides in the brightly painted shops that line the sidewalks and as you make your way to the back of the festival grounds, you will see a colorful shop that displays a prominent Polish flag along with the Polish Eagle. This food shop is an extension of Polonia Restaurant, Houston’s only restaurant that serves authentic Polish cuisine. Owners Andrzej and Sharon Szpak provide a good variety of authentic Polish food including pierogi, golabki, kielbasa, golonka, kiszka, paczki and sernik along with the more common festival food such as turkey legs, chicken on a stick and the ever popular funnel cake. Piwo, wino and non-alcholic drinks are also available. The food and drinks are served by a friendly staff dressed in traditional Polish and medieval costumes. Beautiful Polish Eagle t-shirts, aprons and hats along with other gift and souvenir items are available in the food shop. If you are a genealogy buff or just mildly curious about your Polish ancestry, you should be a member of the Polish Genealogical Society of Texas. The PGST serves to unite Polish researchers, share information, publish Texas research for previously undocumented and unexplored areas, educate others on Polish-Texan history, sponsor trips to Polish Settlements in Texas, sponsor workshops on historical and genealogical topics relevant to Poles in Texas. The society was organized in 1982 to promote genealogical research among individuals of Polish heritage. Yearly membership is only $20.00 and includes 3 issues of the award winning Polish Footprints periodical. Back issues of the periodical are available as hard copies and on a special CD. The Polish Food Store is a favorite shopping destination for Texans looking for authentic Polish foods. The store is located at 1780 Blalock in Houston Texas which is right next door to the Polonia Restaurant and within walking distance of Our Lady Of Czestochowa Catholic church. The store stocks a large selection of Polish sausage, hams, bacon and other meats along with packaged and canned goods and homemade frozen delicacies such as pierogi and uszka as well as Polish memorabilia like flags, T-shirts, mugs, hats etc. You can find more information on the Polish Food Store website or check out these Polish Food Store Photos. The Polish Parish of Our Lady of Czestochowa has become the center of Polish religious, cultural, and social life in Houston. The Polish Parish is a place where Polish values are proclaimed and upheld and also a place where Poles and non-Poles can express fully their fidelity to God. They are not in any sense a closed community, and welcome all Americans and all ethnic groups in our church. A key Polish value is openness to the universal mission of the Church, and thus they try to make their church a place in which their friends and neighbors of non-Polish background can feel comfortable practicing their Catholic faith and expressing their piety and identity. For more information visit Our Lady Of Czestochowa website. or take a virtual tour of the church on the Polish Texans website. With Christmas just around the corner, please take a look at the many great Polish gifts available from our Polish Texans website sponsors. Texas Slavic & German Warehouse: All Things Polish (Polska), Czech, German, Texan, Home Bar & Man Cave! Gifts include Oktoberfest gifts, Authentic Beer Steins, Beer Boots, Pub Signs, Beer Growlers, Whiskey Barrels, Authentic Polish Pottery, Wine Gifts, Custom TShirts & Hats, Russian Nesting Dolls, Flags, Hand Crafted Wooden Folk Boxes & Chests, Polish Novelties, Czech Novelties, German Novelties, Cookbooks, Man Cave & Home Bar Decore & more! Polish Heritage T-shirts and Gifts consists of several on-line stores and is your source for apparel and gift items featuring Polish colors, the flag and map of Poland, the Polish White Eagle and lots more. In addition to the 100’s of Polish Heritage designs, we offer a large selection of Polish American, Polish Texan and Polish Canadian designs. Many of our products can also be custom designed for reunions, parties and special occasions. Our beautiful Polish images were designed by owner James Smock and other talented graphic artists and are printed on demand by several well known and reputable companies.